Hellhounds, a Walking Dead shout-out, and some interesting twists in regards to Lucifer. 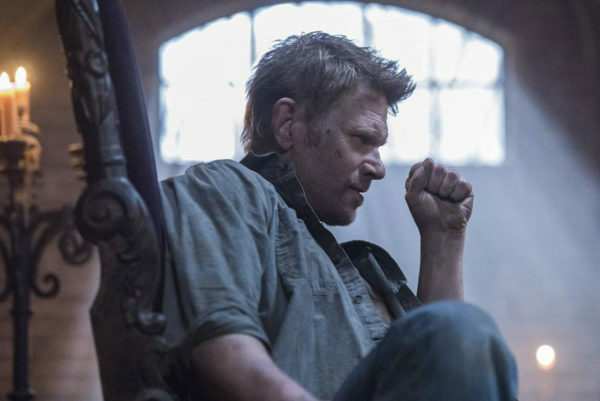 The latest episode of Supernatural showed us that we can no longer rely on what we’ve known before because the rules are changing. 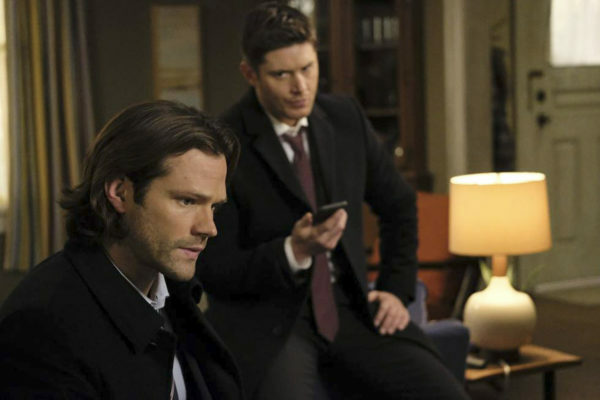 Trust in the Winchesters, because they’re going to be the best chance at surviving the fallout. Before we get into the actual case, I wanted to give a note of appreciation for the Walking Dead shout-out. It was so beautifully done because those who don’t watch the other show or haven’t read the comic would just think that Dean’s making a note of appreciation about a weapon they had hiding in the trunk of the car, yet hadn’t used thoroughly in the series. But those of us in the know could shout for joy at the nod to Negan and his lovely weapon of choice, Lucille. Dad’s still on a hunting trip. Except, this time, he’s killing zombies and humans alike. Okay, onward to the case. We get the return of the Hellhounds, and one in particular. Ramsey was a favorite of Lucifer and she’s on the loose, killing humans who get in her path. They don’t have to sell their souls to gain her wrath, she’s dealing out justice all on her own. After she attacks Marcus and gets hit on the head with an axe, she’s on the hunt for her attacker, Gwen. Don’t hit a Hellhound, they’re not going to like it. And if one hit to the head wasn’t enough, Gwen managed to get a second one in with the green cooler near the end of the episode, essentially saving Sam from a bloody end. She’s traumatized, and exposed to all the creepy things that are lurking in the shadows, but at least Gwen didn’t end up dead like her boyfriend! And why was Ramsey out in the first place? Well, blame the Hell minions. They did it, and wanted to get into Lucifer’s good graces. They found him locked up down in the dungeon, where Crowley had left him, and offered to release their leader…at a cost. But these demons do not appear very smart, because who really thinks they can order around Lucifer without repercussions? Of course they were killed as soon as Lucifer was free. And it appeared that Crowley would be next on the hit list, as a payback for the all the taunting and torture that he had done against Lucifer. But the King of Hell has a few more tricks up his sleeve. He can control Lucifer, torture him without chains or outer implements, because he’s bound Lucifer to his vessel. 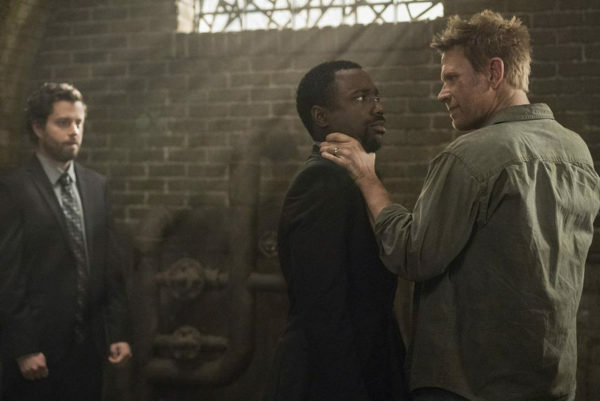 Looks like this is going to be a more even balanced fight, even if it will only serve to make Lucifer more angry and set on revenge. And while Devil Daddy is trying to regain his throne, his baby mama is being pursued by Cas. He’s tracked down Kelly to the diner where she was at the center of an angel / demon attack. That’s when Cas learns that Dagon is protecting Kelly and that’s where his focus should be. Also, his loyalties seem to have realigned a bit in the episode. Instead of utilizing only the Winchesters for the coming fight, he’s been convinced to join his angel brothers as well, in return for being allowed to return to Heaven. It’s a tempting offer, but I wonder if the angels will follow through with it. If all of that weren’t enough, we also got some further touchstones between the Winchesters and the British Men of Letters. Sam admits to Dean that he has been getting cases from Mick, which does not put Dean in a good mood. However, instead of feeling betrayed or lashing out against Sam, he actually thinks about the reasons for and against joining the British Men of Letters in their fight. No, he doesn’t trust them. And the minute they do something that makes them feel uneasy, Dean is out of there. But, he does agree to join Sam in the alliance. I’m not sure if this is going to end well for them, but at least they’re willing to try. Plus, the boys are united. That’s the most important part.